Note: As a prerequisite, the ESXi 6.0 server must have been a fresh install, and not an upgrade from a previous version. If you are replacing your ESXi certificates with CA certificates, the best method is to make your VMCA a subordinate CA and allow it to sign certificates for the ESXi host. Please see directions here for making your VMCA a subordinate CA. I had received the error “Start Time Error” shown below. 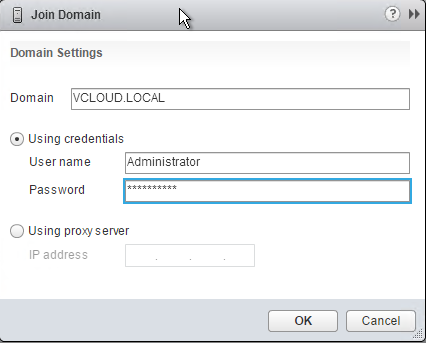 To resolve this I added the ESXi host to the domain, and added the VMCA certificate as a Trusted Publisher certificate in AD, so I have added these steps to the process. Note: I believe the new reason for the error below is because of a known issues where the VMCA signing certificate needs to be valid for 24 hours before you can generate CA certificates from the VMCA. It may not be necessary to join the domain or add the VMCA certificate as a Trusted Publisher certificate in AD. 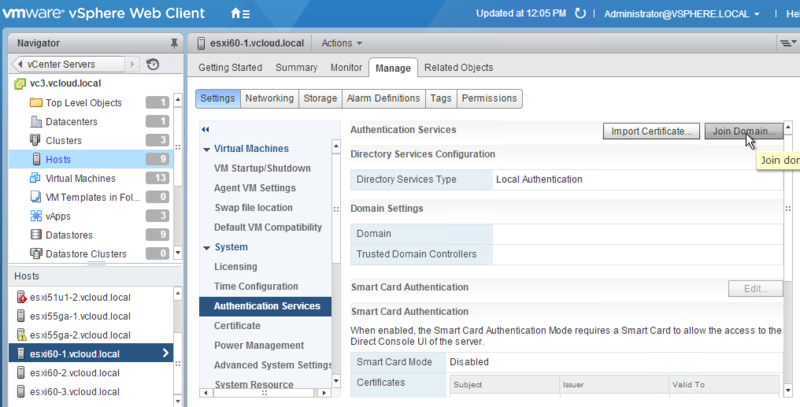 -->    reason = "Unable to get signed certificate for host: esxi60-2.vcloud.local. Error: Start Time Error (70034). Step 4. Enter your domain and credentials. Step 3. 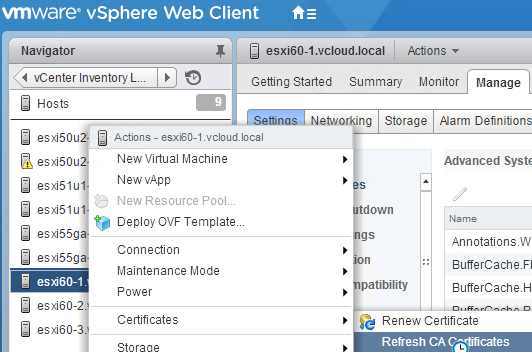 Using the vSphere Web Client, right click on your ESXi host, select Certificates -> Refresh CA Certificates. This will push all certificates from the TRUSTED_ROOTS store in the VECS to the host. It’s as easy as that! If by chance you are using default certificates, you can renew them using the “Renew Certificates option” without making your VMCA a subordinate CA. You would want to do this if you changed the ESXi host name and you need to generate new certificates that match the new hostname, or if the certificate is about to expire. An important thing to note is that if the certificate is already expired, you can simply disconnect and remove the host from inventory, then reconnect it. vCenter Server will renew the certificate of a host added to inventory if the certificate is expired. I hit the same “Start time error” after changing the vcsa cert out for a Msft CA sub cert. I had to wait 24 hours to join any hosts. VM tech support knew nothing of this error. Simply waiting 24 hours and the “problem” was resolved. Yeah, I’m working on getting it made aware. I believe we are working on something for a future release. I didn’t run into this issue with 3 hour old certs. I think it might be fixed in the newer versions that were released. The article states that ESXi hosts added to the vCenter before replacing the CA certificate will not be affected. This was not the cause in my test setyp. I also had to wait 24 hours to be able to update the certificates for these hosts. It states how to replace the certificates in 5.x in a KB for 6.0, and its completely different on how its shown in this post. Navigate to the console of the server to enable SSH on the ESXi 5.x host. Press F2 to log in to the Direct Console User Interface (DCUI). Click Troubleshooting options > Enable SSH. Log in to the host and then navigate to /etc/vmware/ssl . 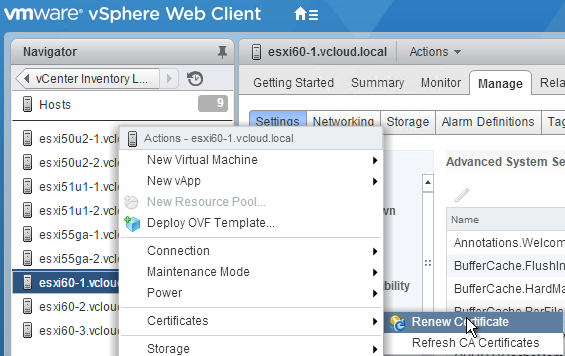 Copy the files to a backup location, such as a VMFS volume. Log in to the host with WinSCP and navigate to the /etc/vmware/ssl directory. Delete the existing rui.crt and rui.key from the directory. Copy the newly created rui.crt and rui.key to the directory using Text Mode or ASCII mode to avoid the issue of special characters ( ^M) appearing in the certificate file. Type vi rui.crt to validate that there are no extra characters. Note: There should not be any erroneous ^M characters at the end of each line. Switch back to the DCUI of the host and select Troubleshooting Options > Restart Management Agents. When prompted press F11 to restart the agents. Wait until they are restarted. Press ESC several times until you logout of the DCUI. Exit the host from Maintenance Mode. When complete, the host is made available and successfully rejoins the cluster. Or this is another way of doing this? You can do it either way. This is for CA certificates, if you want CA certificates and don’t have a subordinate CA setup then the KB is the process you will run through. How exactly did you get the CA certificate? I followed the steps you did above but receive a certificate error because my envrionment doesnt have the CA certificate trusted. I noticed in your screenshots you had downloaded the “Issued to: CA” and “Issued from: ” how did you retrieve that certificate? “Issued to: CA” and “Issued from: your PSC”. Sorry, using brackets did some funny things in HTML.